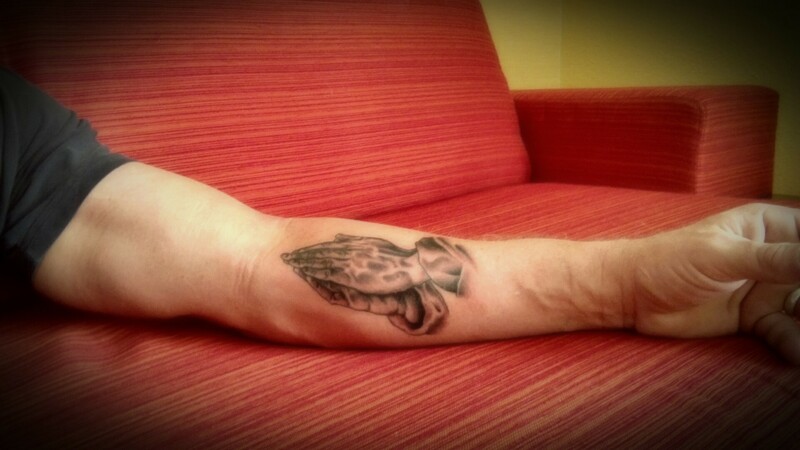 Neither one of us are particularly religious, this tattoo and I. We are decided works in progress -- raw still, easily irritated, gloriously incomplete. Both of us. Lumped together like that, our flaws made us a perfect match for one another as well as for our makers. That is, God and Lui Renzo. I was working in New York City last week and Renzo is a crazy talented tattoo artist in Secaucus, New Jersey, just west of the Lincoln Tunnel. A day earlier I'd asked if he could ink three Hawaiian words (pule 'ole ho'opau) onto my left forearm. He reacted as if I'd raked fingernails across a blackboard. "Yeah, I could... But you'd be destroying prime real estate." To tattoo lovers and artists the wide open stretch elbow to wrist is a beautiful canvas begging for expression. It's one of the few areas on the body where something personal and meaningful can be permanently sewn and seen straight-on by the person wearing it. No mirrors, no circus flexibility, no selfies required. From the forearm a tattoo stares up at you. A constant reminder. I reviewed Renzo's art, a diverse portfolio collected through five years of professional work. 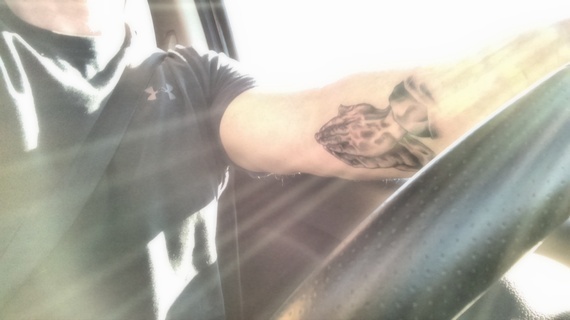 On his own left forearm is a finely detailed black and white of the Virgin Mary and Baby Jesus. At age 35, Renzo, a Catholic who grew up rough in New Jersey and Puerto Rico, has evolved into the archetype renaissance man. He's worked as a truck driver, waiter, cook, reggaeton musician, barber, and, until the predator nature of the sales world clashed with his ethics and morals, as a $30 per-hour Verizon salesman. Today, he inks meaningful works of art or words into the skin of strangers. Loosely translated "pule 'ole ho'opau" means to pray without ceasing. I'm not a biblical scholar by any means, nor am I what anyone who attends church would call religious. When asked about religious affiliation on websites I leave the spot blank or write, "It's complicated." But my Baptist father told me I should never throw the baby out with the bath water, and I believe much of New Testament scripture to be profound regardless of the religious fraternity you pledge. The Apostle Paul's advice in First Thessalonians is an ideal example. In it, Paul encourages the early Christians to be patient, caring and loving, to never return evil with evil, and to rejoice and be grateful always and in all things. This stuff applies to everyone. For me, First Thessalonians 5:17 sums it up beautifully and succinctly: "Pray without ceasing." In book talks and lectures I often explain how that verse reminds me to be more aware of how my words, thoughts and actions affect others. For the better, hopefully, but far too often, for the worst. Long ago, when I was a Native Hawaiian Affairs reporter in Honolulu, a revered healer from the Big Island explained to me how he is unable to cure the sick of anything if he is not pono at that very moment. He described pono as a state of perfect righteousness -- right in word, right in thought, right in action. For most or all people, the religious and non-religious alike, Christian, Buddhist, Jew, Muslim, agnostic or atheist, pono waxes and wanes. It can be strengthened and maintained only through dogged awareness and vigilance. Three miles west of the Lincoln Tunnel in a small tattoo parlor named Our Lady of Ink, I explained some of this to Renzo and told him how I do not believe Paul is saying that we should always walk around with our eyes closed, heads bowed. Just the opposite. To me, Paul is saying we should keep our eyes open, our minds focused, and that we should live in a state of blessed awareness. Live pono, that's what Paul was saying long before I met the kahuna on the Big Island. In Renzo's portfolio one tattoo jumped out at me. Praying hands. The detail was phenomenal. He explained how it was the only tattoo of praying hands that he'd ever done. He'd drawn them just once. "If you can duplicate that first effort," I told him, "I'll have you put it on my arm's prime real estate." "I can't duplicate it. ... I'll do better. I always get better the second time." Today, a Lui Renzo original points up at me lovingly and points me in the right direction. That's not saying I will always follow the direction (I've already screwed up every which way from Sunday) but I can't overlook the advice or easily disregard it. Like me, the tattoo remains a work in progress. One day soon I will return for Renzo to add pule 'ole ho'opau to it as well as the names of two people who look up to me as a role model - for better and for worse. My sons. That's a reminder I need to carry with me (and on me) daily.